Ok, I need everyone to keep an open mind. Don't run away! Sweet corn ice cream is AMAZING. It's my favourite ice cream flavour in the whole wide world. I grew up with it in Malaysia, where sweet corn is frequently used in desserts. I get a lot of mixed reactions when I tell people about sweet corn ice cream, but c'mon. It's SWEET corn. Popcorn ice cream is all the rage at the moment (and it's awesome), so it's not too much of a leap to sweet corn ice cream, right? Trust me, it's delicious. Whenever I eat sweet corn ice cream, I remember visiting relatives around Malaysia and waiting with my cousins on the street for the ice cream man to drive up on his little motorcycle with a big chilled metal box on the back. We'd buy sweet corn (and red bean) potong (cut) ice cream on a stick and they'd already be melting on to our hands before we had even started eating them. The ice cream was lightly flavoured with sweet corn, with a hint of coconut milk and little chunks of corn kernels throughout it. Whenever I go back to visit my parents, my Mum will always buy me a big box of sweet corn potong ice cream; she knows me too well. Obviously sweet corn ice cream is very hard to find in Sydney. I've tried to make it at home using recipes I've seen on other blogs and I never found a recipe that was quite right. The flavour was either too rich or artificial or the texture wasn't quite right. It couldn't be too rich or too sweet, and it had to be distinctly flavoured with sweet corn with lots of chunky pieces throughout. So I finally gave up with other recipes and jumped into the kitchen and started experimenting. The results were pretty darn good. 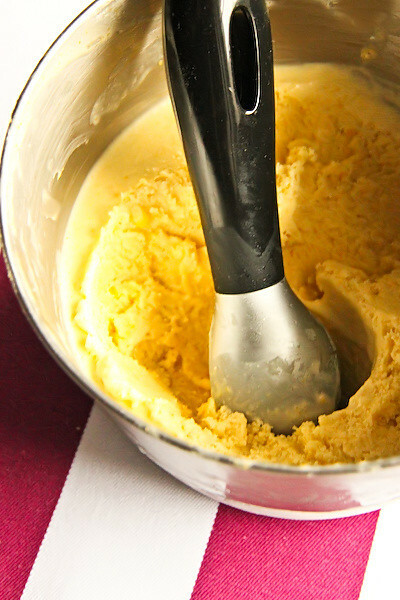 This ice cream does not require an ice cream maker, in fact it doesn't require any churning at all and it's SO easy! The whipping of the cream combined with the condensed milk means that it's light and fluffy enough to have the right consistency and texture of normal ice cream. It's packed full of sweet corn flavour, as well as a light tinge of coconut. Slice corn kernels off the cobs and place both the kernels and the remaining cobs in a medium sauce pan with coconut milk and water. Slowly bring just to the boil on the stovetop and then simmer on low for 20-30 mins or until the corn kernels are cooked through and the liquid has reduced by half. Remove from the heat and set aside to cool completely. For a more subtle corn flavour, strain all the kernels out of the coconut milk and only stir in the 3 tbsp of corn kernels when you are ready to freeze (to be used if you want whole kernels of corn in your ice cream). If you want a stronger corn flavour, do not strain all the kernels out of the mixture. Place the mixture with the remaining corn kernels in a food processor or blender and pulse until smooth. Strain mixture to remove any large lumps. Chill in the refrigerator while preparing the rest of the ice cream mixture. Whip cream in a large mixing bowl until it reaches soft peaks. Fold in sweetened condensed milk (or beat in with electric mixer on low, take care to not overmix). Finally, fold in coconut milk mixture and leftover whole corn kernels and pour into a 1L capacity container for freezing (I froze mine uncovered in a stainless steel bowl). Freeze overnight or until set. I found my ice cream was fluffy enough but if you find your mixture is too icy, churn once in a food processor before refreezing again and it should be nice and smooth. It might seem weird to those who have never heard of it before, but don't bag it 'til you've tried it. 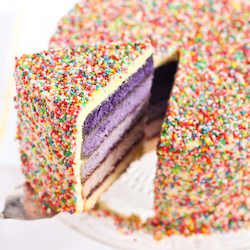 Hopefully one day someone in Sydney will sell it, but for now I'm more than happy to whip some up with this recipe. O la la !!! sweet corn!!! I wanna try.. NOW!!! Never heard of it, never would have thought of it. also craving it big time. gahh! 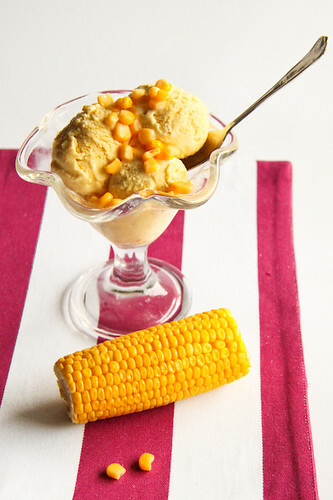 omg I love corn but I have never had sweet corn ice cream before! I can totally see how it would work though, and it's great that this recipe doesn't even need an ice cream machine yay! Me want now!! I remember chowing down on sweet corn ice cream with a big ol' bowl of ice kacang (ABC FTW!). It's def one of the best freaking ice cream flavours in the world. Oh man, I have never had sweet corn ice cream before. Might be worth a try, it's so easy and it will be a totally new experience for me! Never had this before but corn on the cob is one of my favourite foods so I think I'm going to love it! 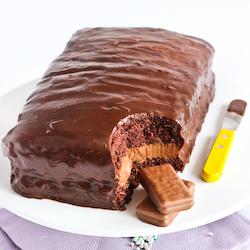 I was about to eat dinner, but now I just want to eat this!!! We always had this during my summers in the Philippines. We also had cheese ice cream and avocado yum i love it! Maybe you will get to sell it one day! I didn't even START to run away, I promise! I wanna eat your ice cream! Thank you sooooo much. I am Malaysian too residing in England and everytime I tell people about sweetcorn ice cream, everyone looks at me like I'm dodgy. I'm intrigued..! I've never tasted corn ice cream but I'm sold! Yum, makes perfect sense to me, add some salted caramel swirled in and it's perfecto, now where's my icecream maker? 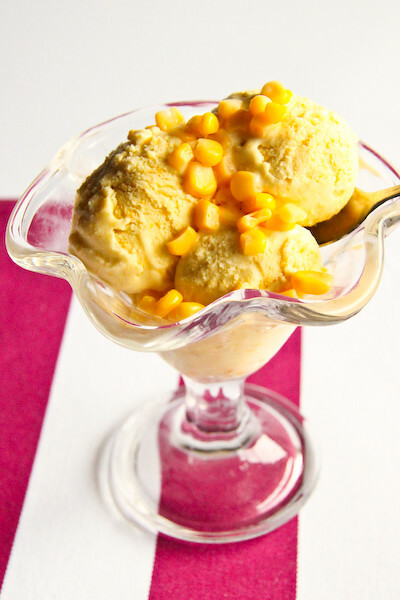 i absolutely love sweet corn, so I can imagine this ice cream beign super dooper yummy. I'd like to give this recipe a go. This sounds SO amazing! I can't wait until it's sweet corn season again! I think ice cream needs more creativity like this! 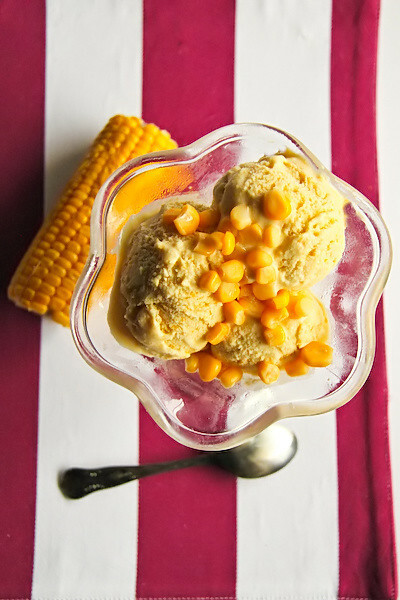 There's so many vanilla and chocolate and strawberry ice creams out there but nothing super interesting and definitely nothing as imaginative as sweet corn ice cream! 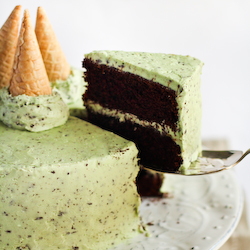 Going to have to try this one with my ice cream maker now! 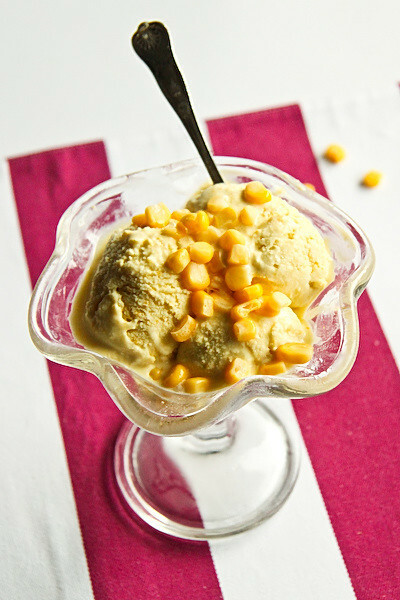 Yep we have sweet corn ice cream back in the Philippines too! Mmmmm perfect for the coming summer hey? hi :) we eat a lot of corn ice cream in Brazil too, sorvete de milho, it's actually one of the most popular and traditional flavors, completely normal! i made it in the US and got a lot of funny looks. corn is also used for sweet juice, candies and cakes in brazil. though i don't think i would ever eat ice cream with whole kernals of corn on it! I would love to try some of that sweet corn ice cream, it sounds awesome! You can sell it! Steph's Sweet Corn Ice-Cream!! the dainty baker - Sweetcorn ice cream is the best! Try it!! Margaret Tran - Heehee thanks! Aww I want to try popcorn ice cream as some point too! Thanks for the RT love btw! Sophie - Try it, it's the best flavour! Laura - I hope you would like it! You should try it! Mary @ stylefyles - Ooh sounds interesting with the raspberry, thanks! Minh - I can't belive you didn't try it in Malaysia! It's the freaking best thing ever. Jacq - You have to try it sometime! It's the best. If anything my recipe is a little bit too strong on the corn flavour compared to the original, but still good! Karen @ Citrus and Candy - Mmm abc. :) You will have to come over and have some! Jen - Aww if you like corn on the cob I think you would definitely enjoy this! Trissa - Ooh cheese ice cream and avocado ice cream! Wish I could try those! Conor @ Hold the Beef - Good! :D You should try it sometime! YaYa - Ooh salted caramel, that would be so sweet! linda - You should! Though in hindsight I would have liked to try half of it without the sweetcorn in the puree and just some corn kernels swirled into it..more subtle! You should try it like that! whisk-kid - Thanks! Yes it's definitely better with super sweet sweet corn! Celeste @ Berrytravels - The more ice cream the better, definitely! Mallory Elise - Yes I've heard of it being in Brazil! Haha glad I'm not the only one getting funny looks. Oooh corn candy. I need to get myself to brazil! Aww don't knock the kernels til you try it! We eat creamed corn in an icy dessert in malaysia. Brilynn - It is awesome! try it! LOVE corn, corn AND ice cream together sounds awesome! woah "does not need an ice cream maker"!! 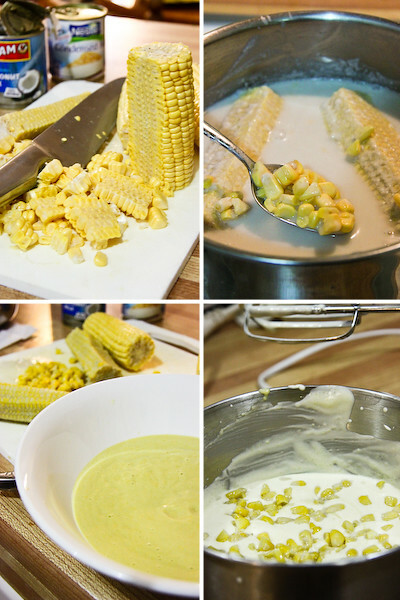 i just ate sweet corn ice cream on the weekend and loved it :) i'm gonna make this when the heat starts to kick in in Melbourne! Angie Lives to Eat (and Cook)! - Trust me, it's the best! grub - Hehe how awesome is it? Hope the recipe works out for you! Anonymous - I'm so glad to hear it turned out well! Thank you for the feedback, and the avocado ice cream sounds amazing, I love avocado in desserts! Brilliant! Always on the lookout for easy icecream recipes (preferably sans icecream maker) and I'm definitely game for trying new things. Love the pretty yellow colour. There is a restaurant here that has sweet corn creme brulee - it's totally delicious. Marisa - Yes i always get sad when I can't make a recipe because I have no ice cream maker! Thanks! Anonymous - Ooh sweetcorn brulee sounds awesome! Wow, brings back great memories of my childhood in Malaysia. My brother and I would listen for the ice cream man as he made his way through our neighbourhood on his motorbike and we'd rush out at the first sound of his bell. 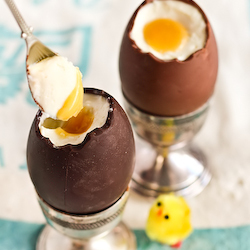 This recipe looks delicious and I'm going to give it a try! Thanks! I love, looove corn icecream and can't wait to try it out. Can I ask some stupid questions: 1) call me lazy, but could I substitute canned corn (whole? creamed?) 2) would it work if you did use an icecream maker? CC - Canned corn should work fine! I'd definitely go with creamed. Unless you want whole kernels of corn throughout the ice cream then maybe add some whole corn after churning? It should work better in an ice cream machine! I only did it this way because I didn't have one at the time. In fact I may redo the recipe now that I have a churner, to see if I can improve on it. Biggest problem I had was that a lot of the corn skin settled at the bottom and messed with the smoothness of the ice cream, so that's why I edited the recipe to take out some of the corn. Hope that helps. Good luck! 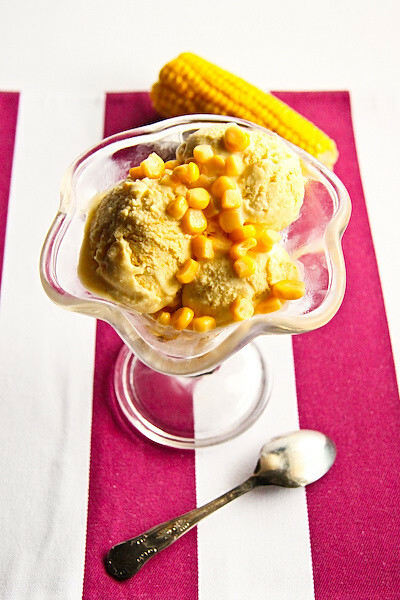 i LOVE sweet corn ice cream - I'm so making this with my new ice cream maker! !